This is a set of 4 Round luxury aftermarket custom made CUSTOM 3D Domed Gel black on chrome colour to fit vw volkswagen alloy wheel center cap badges . Please do not ask for a custom design if it is the VW logo, WE WILL REFUSE. Why not have your name or initials (NOT VW), name, logo or any other Monika. Stand out from the crowd with your very own personalised branding. IF YOU PLACE AN ORDER WITH AN INCORRECT OR MADE-UP CUSTOM FILE NAME THAT WE HAVE NOT PROVIDE YOU, WE WILL SEND A BLANK BLACK BADGE AT THE SIZE YOU SELECT, IF YOU WISH TO CANCEL YOUR ORDER IMMEDIATELY. 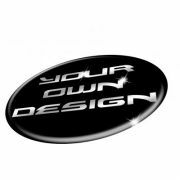 THERE WILL BE A CANCELATION FEE OF £5.00, IF A SAMPLE PROOF IS THEN CREATE AND YOU THEN SAY YOU WANT A TRADEMARK DESIGN THERE WILL BE A £10 DESIGN & CANCELATION FEE. These guys did a great job following up with me via email when I had questions prior to ordering my product. I ordered what I wanted and I couldn't be happier. Thanks Guys! I contacted Matt with a few loose ideas of what I was looking for, he was very knowledgeable and helpful in informing me of the different finishes and techniques he employed to create the designs. After settling on a final design, Matt quickly sent back a design to check I was happy. Payment and postage was seamless - and the finished result exceptional. Great service, great communication, great product - especially for custom designs. I wouldn't hesitate to recommend Matt and the team at Signdezine.